NIDA researchers have added another piece to the puzzle of what makes nicotine so addictive. Dr. Daniel McGehee and colleagues at the University of Chicago have shown that along with directly stimulating the brain’s reward system, nicotine also stimulates it indirectly by altering the balance of inputs from two types of neurons that help regulate its activity level. This additional stimulation intensifies the pleasure from smoking and makes it last longer. Scientists have long known that nicotine, like other addictive drugs, attaches to the core neurons of the brain’s reward system, where beneficial behaviors (such as drinking water when thirsty) are rewarded and reinforced. Situated in a region of the brain called the ventral tegmental area (VTA), these reward-system neurons, called dopaminergic neurons, trigger release of the neurotransmitter dopamine (DA) in a nearby brain region called the nucleus accumbens (NAc). When nicotine attaches to these neurons they increase their activity, flooding the NAc with dopamine, which produces pleasure and a disposition to repeat the behaviors that led to it. That pleasure and disposition drive the process of addiction. Exposure to nicotine has direct and indirect effects on dopamine release in the brain’s reward center, the nucleus accumbens. In the new research, Dr. McGehee’s team followed up on a clue that nicotine attachment to the DA neurons in the VTA accounts for only part of the drug’s pleasure-producing and ultimately addictive effect: Nicotine attachment stimulates the DA neurons for only a few minutes at most, yet dopamine levels in the NAc remain elevated for much longer. To explain this discrepancy, the researchers studied nicotine’s impact on two other types of neurons that affect dopamine levels. These neurons produce neurotransmitters, called glutamate and GABA, that act as fundamental pacemakers throughout the brain. Once released by its producing neuron, glutamate attaches to other neurons, including the DA neurons in the VTA, and stimulates them to speed up their activities. GABA has the opposite effect: It slows neurons down. The researchers hypothesized that nicotine might act on these pacemaker neurons so as to increase the ratio of glutamate to GABA in the VTA. If the amount of glutamate acting on DA cells were to increase while the amount of GABA remained the same or decreased, the result would favor high levels of dopamine in the NAc. If the glutamate-GABA imbalance were long-lasting, it would explain why dopamine levels in the NAc remain elevated even after nicotine stops directly affecting the dopamine-producing neurons. To test their hypothesis, Dr. McGehee and his colleagues exposed rat VTA cells to nicotine for 10 minutes--roughly the time it takes a person to smoke a single cigarette. By measuring electrical properties of the brain tissue, they found that nicotine affected both pacemaker neurons. In glutamate-producing cells, the brief nicotine application induced a condition known as long-term potentiation, which promotes high-level activity for an extended time. When they evaluated the effect on GABA-producing cells, the researchers found that after an initial increase in GABA transmission lasting only a few minutes, GABA transmission decreased and did not recover fully for more than an hour after nicotine exposure ended. Overall, the result was what the researchers hypothesized: a sustained increase in the VTA’s glutamate-to-GABA ratio. A brief application of nicotine can induce a lasting effect on excitatory [glutamate] signals to the brain’s reward system," summarizes Dr. McGehee. "This suggests that in humans a relatively short nicotine exposure, even for someone who has never smoked before, can cause long-lasting changes in excitatory neurotransmission. 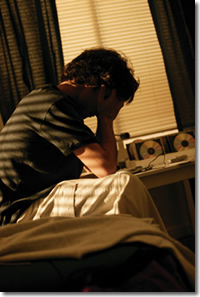 It may be an important early step in the process that results in addiction. 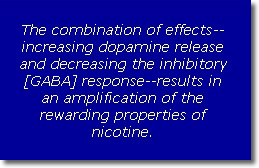 "The combination of effects--increasing dopamine release and decreasing the inhibitory [GABA] response--results in an amplification of the rewarding properties of nicotine," explains Dr. McGehee. "It would be difficult to design a better drug to promote addiction." "Understanding these mechanisms is an important step in explaining how a brief exposure to nicotine results in the long-term excitation of the brain’s reward areas," says Dr. William Corrigall, director of NIDA’s Nicotine and Tobacco Addiction Program. "It gives us a clearer picture of how smoking can lead so quickly to dependence and addiction, and it also suggests a possible new avenue of investigation for pharmacological treatment." Mansvelder, H.D., and McGehee, D.S. Long-term potentiation of excitatory inputs to brain reward areas by nicotine. Neuron 27(2):349-357, 2000. Mansvelder, H.D. ; Keath, J.R.; and McGehee, D.S. Synaptic mechanisms underlie nicotine-induced excitability of brain reward areas. Neuron 33(6):905-919, 2002.